The fourth yo-yo in the artist series created by The Steve Brown Gallery will be released Thursday, May 27th only at www.stevebrowngallery.com. This model will feature artwork provided by Doktor A. This Artist Edition Yo-Yo will be limited to 45 pieces worldwide, and will never be manufactured again. One side will be laser-engraved with original art, while the other side will be engraved with the artist’s signature and the Steve Brown Gallery logo. The yo-yos are made in the United States in the traditional fashion of yo-yos from the 1920s, turned from a single piece of Hard Rock Maple. 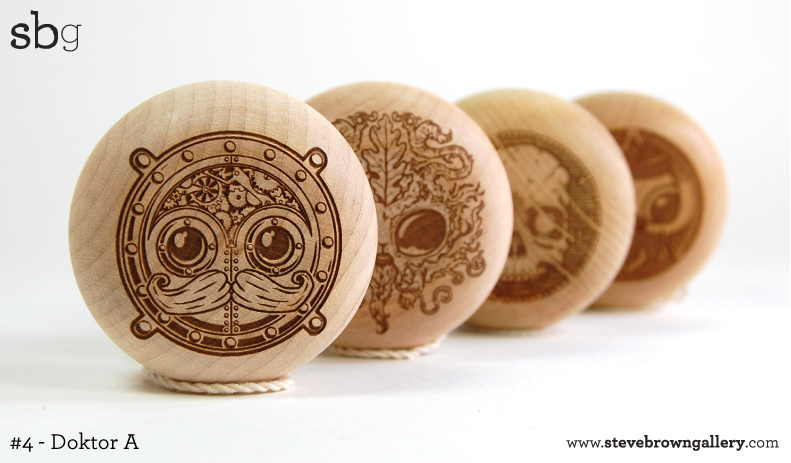 These wooden yo-yos are meant to evoke a simpler time. The yo-yo is the second-oldest toy in the world and still one of the most popular. On May the 27th something cool is going down. And then coming back up again. And then going down again….